Solar energy systems are compatible with traditional as well as modern building materials and styles. Using solar PV panels and modules in much the same way as you might use safety glass, unique and innovative solar power systems can be designed, built and integrated into buildings and landscapes. Can be used for a decorative awning on a side of a family home or a cover for a car park, Solar PV Canopies have the combined benifits of generating electricity, using unitilised space and providing shading. Different types of panels and laminates can be used such as clear or opaque depending on whether you prefer light or shade underneath the canopy. 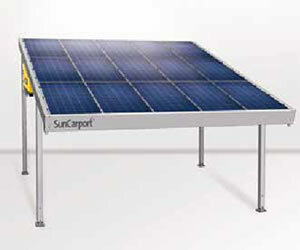 Solar PV Canopies are constructed using lightweight aluminium with power cables being built into the supports. A versatile but simple solution that elegantly delivers a generous amount of additional outside covered space for car parking, entertainment, storage etc as well as create a new area for solar PV panel mounting.